Italian Master Chef, Chef Consultant, Culinary Instructor. Fresh Simple food with beautiful presentation and irresistible flavours. 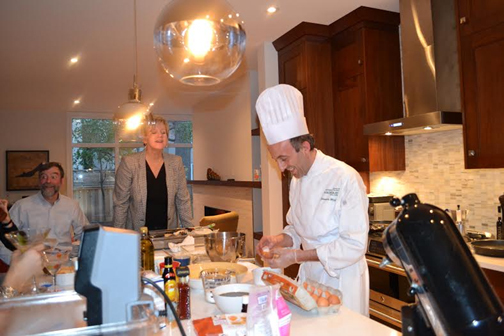 The sweet taste of generosity: Linda Hunter’s gourmet dinner with Chef Maffini Since 2009, guests at Baskets with Panache! have supported the Canada Agriculture and Food Museum’s Youth Fund with their generous bids on auction items. Many bidders win themselves truly unforgettable experiences. This was certainly the case for Linda Hunter, who won a gourmet three-course dinner prepared by the renowned Chef Giampaulo Maffini for herself and five guests. Linda and her guests enjoyed a delicious spread: home-made duck ravioli with wild mushroom cream sauce, an oven-baked rack of lamb in almond crust, potato duchesse, vegetable ratatouille and green peppercorn sauce, among other mouth-watering offerings. The meal had a selection of wine pairings from Savvy Company and poured by a sommelier-in-training currently studying at Algonquin College. The evening was also an interactive experience as Chef Maffini described his cooking techniques and offered the group some hands-on training in professional cooking. It was a memorable evening for Linda and her guests, and one that makes future memory-making trips to the Canada Agriculture and Food Museum possible for underprivileged children. On behalf of those children and the Canada Agriculture and Food Museum, the CSTMC Foundation would like to thank Linda Hunter, Chef Maffini and Savvy Company for sharing this story and for their generous support in opening up the fascinating world of agriculture and food for all.